This is a very good restaurant. Better than Kendo in Ginza. Amazing service from Voyagin. I wouldn't have been able to reserve the restaurant without their help! Such a great lunch full of surprise at Sushi Morita. The 82 years old head chef Mr. Morita Nobuo is serving us impressive and unique Kyushu Mae Sushi (九州前寿司). Using the ingredients from Kyushu, every piece of sushi the chef will squeeze Kabosu (Japanese citrus カボス) juice on top to make the taste fresh. The chef good at using different combinations of ingredients to make sushi creative. Such as sea urchin and flying fish roe on squid sushi, abalone sushi with abalone liver on top. As a foreign customer, you won't feel uncomfortable, the atmosphere is relax and the chef is a very kind person. 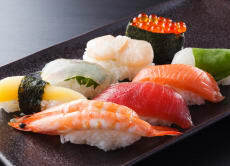 If you don't understand what kind of sushi you eat, the chef will ask his wife to show you a card with the ingredient's name writen by English, Japanese and Kanji (漢字). Lunch time the restaurant offers 8,000 yen or 10,000 yen Omakase (Chef's choice set), i choose 10,000 yen set which including 20 pieces of sushi. After all, i ordered 2 more pieces per person, end up the total price is 24,330 yen. Good price with outstanding quality. Worth to try and i will thinking of come back again. Sushi Iwa was a good experience! We ate there just as we arrived after landing from america. We were not seated at the main restaurant but around the corner. The chef was very good and communicated in english. The reservation concierge was very fast and professional. My girlfriend and I had a fantastic time dining at Sushi Tokami! The food was delicious -- the various preparations of tuna being a standout -- and chef Sato-san was extremely friendly, conversing with us in English throughout the meal.